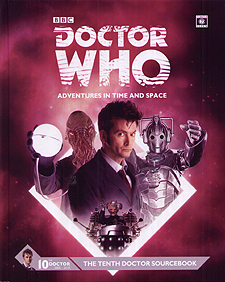 Celebrating the 50th anniversary of Doctor Who, this Sourcebook explores the Tenth Doctor's adventures on Earth and beyond. With detailed information on all the allies, enemies, aliens and gadgets that he encounters, as well as examining each of his adventures, the book contains a wealth of material for the Doctor Who Rolelaying Game, and is also a fact-packed resource for fans of the show! After sacrificing himself to save Rose, the Doctor regenerates once more and immediately has to defend the Earth from alien invaders in his dressing gown. Travel back to Pompeii, forward to the end of the universe and set off on a memorable voyage on the spaceship titanic. Discover you are not alone, find out who Harold Saxon is and thwart the return of the Time Lords (again).